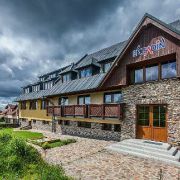 Whether going to mountains in winter or summer, you want to feel comfortable and pleasant, want to be surrounded … More » by qualified and friendly staff and use additional recreation and relaxation services on professional level during your stay. All these offers family guesthouse Houda Bouda. 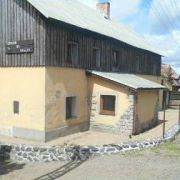 The cottage is situated in beautiful nature in the end of village Oldříš, 4km from Merklín. Newly equipped apartment … More » with WC + shower, TV/sat, possibility of extra bed, completely equipped kitchen unit, 2 double-rooms and hunting lounge. 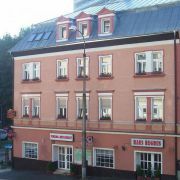 Offer accommodation in 2,3, and 4 beds rooms. Max capacity 30 persons (2x15 persons). The whole cottage has two … More » identical halves, each half has a separate entrance, ski room, downstairs is kitchen with a dining room/TV/SAT. 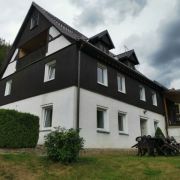 Comfortable mountain apartments have fully equipped kitchen, bathroom, hair dryer, TV/sat and safe. 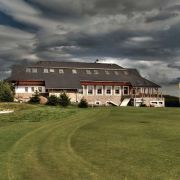 In the object … More » there is wellness washing machine, bicycle storage room, heated ski room, children's play area, WiFi, table football, common room with a fireplace, bar and TV. Parking. Newly built family pension is situated in the centre of Bozi Dar, rooms with 2–5 beds, each has own bathroom, fully … More » equipped kitchen, TV/SAT. 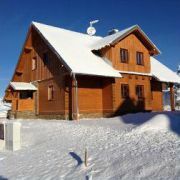 Pension has own parking area with camera system, common room with fire place and large-screen TV, dinning room, ski storage. 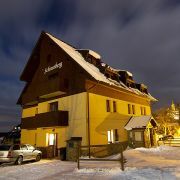 bublava No.327 - in the centre of village and directly by ski lifts (250m). 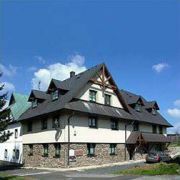 Accommodation for 4-9 persons. Kitchen … More » , living room (hearthstone, TV/sat), 4 bedrooms, 2x WC, bathroom - shower. WiFi free of charge. 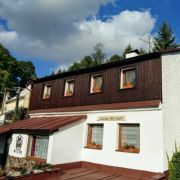 Mountain cottage Fanda is situated in village Marianska about 6km from border Bozi Dar and 20km from the spa Carlsbad … More » (Karlovy Vary). Capacity is 9 persons, with additional beds 10 persons, large garden, parking possible, active rest in the winter time and summer time. 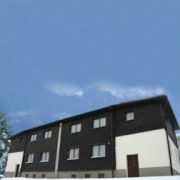 Three rebuilt apartments 3+1 are situated in one building, one apartment has capacity 8-10 persons. Apartments … More » are equipped with kitchen, cooler, microwave oven, TV+SAT+DVD. 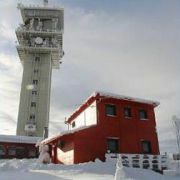 Four cabin lifts (200-500m). 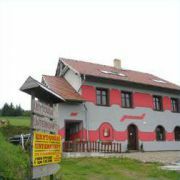 Restaurant, disco, shops, cinema, post office, infocentre 10-50m. Pension Medard has 30 rooms with a total capacity of 97 beds. Dining room and restaurant with a fireplace, both … More » non-smoking. All meals are prepared from fresh ingredients without the use of pre-prepared products. Wi-Fi, Internet Café, bar, summer terrace, volleyball court, playground. 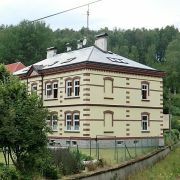 Mountain cottage is located in the village Pernink in the Ore Mountains near Carlsbad (Karlovy Vary) in the altitude … More » of 850m. 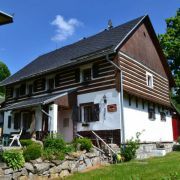 The cottage for family and group recreation. Rooms have their own sanitary facilities. 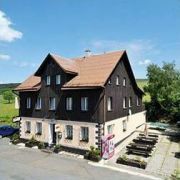 Mountain hotel Krusnohorsky Dvur is situated in the beautiful countryside of the Ore Mountains at an altitude of … More » 865m, close to the border with Germany. Newly built modern hotel offers year-round accommodation in luxuriously furnished rooms at very reasonable prices. 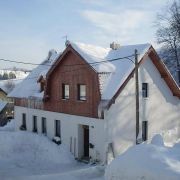 We offer accommodation in 2 spacious apartments in the privacy of newly built timber cottage in Bozi Dar. Each … More » apartment has fully equipped kitchen with dining part, living room, bedroom, bathroom and WC. There is heated dryer for ski boots, ski racks. Parking space, room for bikes. 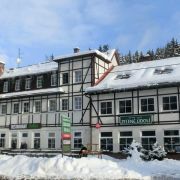 The hotel is situated in the Plešivec Ski Area - the most modern ski resort in Ore Mountains, directly on the ski … More » slope. 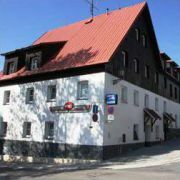 Cosily furnished hotel with timeless-style restaurant offers complete services of 3 stars hotel, including 20% discount for ski pass for hotel guests. Free parking. 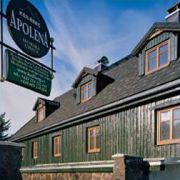 Family atmosphere in the heart of the Ore Mountains. Near the ski resorts Plešivec, Klínovec, Potůčky and Boží … More » Dar. Ore Mountains Cross-country Track System only 150m behind the cottage. 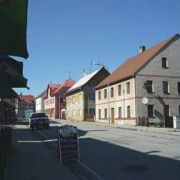 We offer accommodation in cottage in village in Sucha in the Ore Mountains under mountain Klinovec, about 1km from … More » Jachymov in beautiful and peaceful surroundings. 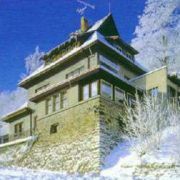 About 1.5km from the center of the Spa Jáchymov. Ideal for skiing, cycling and hiking. Suitable for families with children. We offer accommodation in newly renovated flats with kitchen and bathroom. Separate units. Each flat has TV and … More » wifi. Possibility to storey skis, bikes, etc. 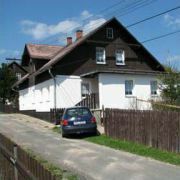 The house is located in the town center with excellent public transport availability. 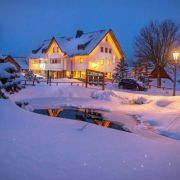 Pension is situated in mountains centre. There is possibility of winter or summer recreation.